The article to which this is a supplement can be found here. Page 1 of 11. Transcriptions of Tom La Touche’s letters 1882-1910, and a brief biography illustrated by contemporary photographs. This electronic supplement includes a more complete pictorical and written account of the 1897 Assam earthquake, with links to transcriptions of letters 1882-1910, and biographic and bibliographic materials. The Shillong map (figure 14) is clickable and shows many hitherto unpublished photos of Shillong before and after the earthquake. The links include voluminous materials for readers curious to learn more about the life and writings of Tom LaTouche (b. 30 Oct 1855, d. 30 March 1838) from shortly after he arrived in India in 1882 to when he retired in 1910. The transcriptions are from British Library shelfmark: Mss Eur C258. Copyright to the source materials from which these are transcribed are retained by the British Library, London. Notes on the transcriptions. In the transcriptions I have omitted personal materials about the LaTouche family. Where they interrupt the flow of the text, I indicate gaps by three dashes (---). Indecypherable words are indicated with square brackets and a query in italics [thus?]. Comments not in italics enclosed within square brackets [thus] are used in lieu of footnotes. Additional punctuation has been added to LaTouche's extracts to clarify their inferred meaning. LaTouche often indicated punctuation by spaces and new lines on his written pages. Throughout these pages I refer to La Touche as LaTouche (omitting the space that he sometimes used in his publications). Transcription errors are entirely the responsibility of the author. Photographs. The text in this supplement is illustrated by additional photographs of the 1897 earthquake from the author's personal collection that were omitted from the published article since it would have resulted in unacceptable length. Many of these photographs were taken at about the time of LaTouche's visit to Shillong, and although the provenance of the album in which they were found is unknown (obtained from a UK bookseller), on their obverse some bear the imprint of "S. K Chakravarti, Photo Artist. Shillong", an accreditation linked to some of the figures reproduced by R. D. Oldham in his 1899 memoir, and mentioned by him in his letter to LaTouche dated 3 July 1897. Readers are invited to use these photographs for academic purposes citing the source [Bilham, R., Tom la Touche and the great Assam earthquake of 12 June 1897, Letters from the Epicenter, Seism. Res. Lett., 79(3), 426-437, 2008. doi: 10.1785/gssrl.79.3.426.]. A DVD of high-resolution scans (3000 dpi) of more than 50 photographs illustrating Shillong before and after the 1897 earthquake is available from the author. The additional materials in this electronic link are illustrated by photographs taken by LaTouche during his field work that have survived in the Calcutta archives of the Geological Survey of India and which are reproduced, where stated, with the kind permission of the Director Geological Survey of India, Calcutta. LaTouche published more than 50 articles (see chronology), but his masterpiece is his "bibliography", a compilation of all articles written on the geography, geology, palaeontology and minerals of India. This was published following his retirement to the UK as four thick volumes totalling in excess of 2000 printed pages (with the encouragement of Oldham whose own 1889 bibliography it superceded). The last volume is a geographical index to Indian geological and geographic materials that was completed by LaTouche in 1937 at the age of 81 and published a few months before he died in 1838 (see Obituary). It contains an alphabetical list of locations with their geographical coordinates, stating what may be found at each location, with references to source materials and authors. The reason for LaTouche's letters. LaTouche's daily letters written to his wife Nancy (Anna La Touche, née Handy) were a custom established early on in their marriage when Nancy and he arrived in India. In these early days, Nancy insisted that they wrote to their relatives daily, and the custom continued with letters to each other whenever they were separated by his geological responsibilities. Although in their early years Nancy traveled with him, eventually, with the arrival of children it no longer became manageable, and Tom spent 9-11 months each year in the field, writing home daily. Their letters form a record of his activities from when he was married in 1891, to when he retired in 1911. His neatly folded four-page letters to Nancy who lived with their children in the hill station of Simla during the summer of 1897 take the form of a starting page of nostalgic remarks about his love for his wife, often with a response to the content of her previous daily letter to him. Here is a 25 June1897 example of his endearments, "I'm afraid you will find this letter very uninteresting, No I don't mean that, for I know you to be interested in what I am interested in, but my head is full of earthquakes, and my heart is full of love for you. My dearest love to you sweet, Your own husband, Tom". His letter invariably concludes with a page of hugs and kisses for his children. The central two pages describe what he did that day, and these are extracted in diary form below. link to letters The text below is an expanded story of the 1897 Great Assam earthquake. Prelude to the 1897 earthquake: Richard Dixon Oldham, was Acting Director of the Geological Survey of India (GSI), and in Naini Tal at the time of the great Assam earthquake, quite unaware of its severity. In June 1897 he had been directing the GSI for 9 months during Director Carl Griesbach's leave of absence in Europe. LaTouche's telegrams and letters drew him back to the headquarters of the GSI at a somewhat unhurried pace since he was bent on inspecting the hillslope stabilization schemes of Naini Tal in which he had played an important advisory role. He had hardly felt the earthquake. When he arrived in Calcutta he realized the significance of the earthquake and took over operations, dispersing all available geologists to the damaged regions in NE India. The timing occurred at the beginning of a ferocious summer monsoon in the epicentral region. Some three months later his geologists had returned from the field (having worked through the worst of monsoon rain) with quantitative estimates of shaking, which, together with his own traverse of the region in the drier winter months, formed a 62 page observational appendix to his memoir. The first and largest of the field observations was contributed by LaTouche (LaTouche's field report as a 3 Mb.pdf), whom Oldham had asked to oversee the office in his absence. Many of the photographs and drawings of earthquake damage and its effects that Oldham included in his memoir were taken, acquired or drawn by LaTouche. ▲Figure 1. 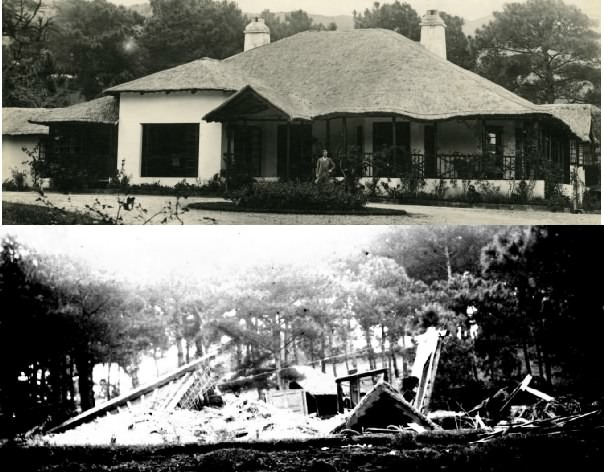 Photos available of of LaTouche were taken a dozen years before (left) and a dozen years after (right) the 1897 earthquake (both reproduced courtesy of the Director GSI Calcutta). He was exceptionally fit and spent long months in the field under canvas. During recess in Calcutta he stayed fit by playing golf & tennis and riding a bicycle. He was a prolific photographer and dozens of his geological negatives (half plate and whole plate formats) and a few prints survive in Calcutta. The British Library archive fewer than half a dozen. During a planned three week absence from Calcutta Oldham had asked Tom LaTouche, two years his senior in age, but two years his junior in terms of seniority in the GSI, to oversee the operation of the Calcutta headquarters. Oldham's interest in NainiTal had started within months of his arrival in India in 1879 [Oldham, 1880]. In 1880 while recuperating from malaria in the Himalaya Oldham had been asked to report on a landslide there that had resulted in several deaths, and whose recurrence threatened the collapse of Government House [Medlicott, 1880]. 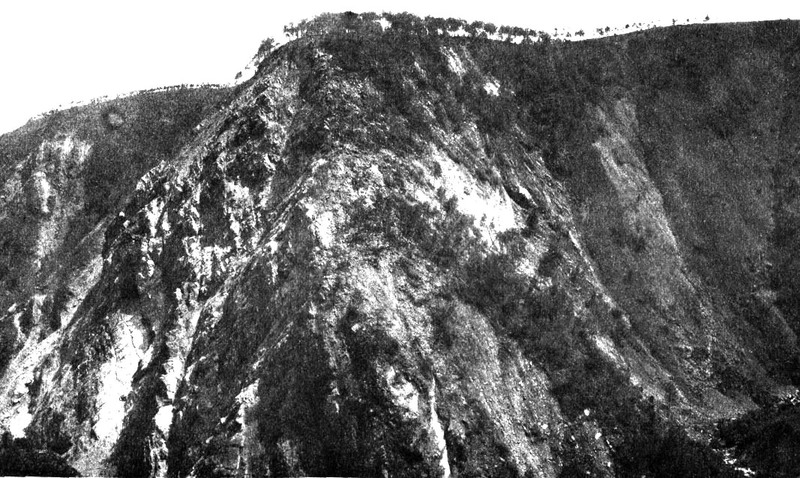 He had maintained a keen interest in the plans to mitigate further hillside collapse, based on his own observations, often taking a dissenting view orthogonal both to the conclusions of the committee formed to offer its recommendations, and also to the Director, Carl Griesbach who reluctantly refereed the decision for the Government. During Griesbach's leave-of-absence, Oldham had been appointed Acting Director and was now availing himself of an opportunity to inspect the engineering works at first hand. On 27 May 1897 LaTouche wrote to his wife of Oldham's departure "Mr. O is off to Simla tomorrow evening and has been giving me directions today about the office. I shall have very little to do. Only to sign a few papers now and then. He says that he will be back on the 20th June. He is going to Naini Tal after Simla to see how the new drainage scheme works when the monsoon bursts. There's 5 o'clock striking now and I want to go off and have a round of golf." LaTouche's letters indicate that his diverse interest in sports, music and other social activities started promptly after office hours. Golf, billiards, tennis, music and various card games feature prominently in his letters home, but his comment that he would have very little to do in the next few months proved far from the truth. As it happened Oldham's departure from Calcutta was delayed until the 29th May, and when it occurred, it did so in one of the last dust-storms of the disastrous 1896 drought, a few days before the onset of an appallingly wet 1897 monsoon season. "Mr. Oldham did not go to Simla after all yesterday. He had an accident out driving on Thursday. His pony came down crossing the tramlines and both Mr. O. and Dr. Anderson were thrown out & the former felt so much shaken that he did not care for a long journey yesterday. He is going tonight and has just been to give me final directions for running the office in his absence. It is lucky for him that he was not smashed up, for it might have been a very bad accident. The trap was knocked about a good deal. He has asked me to take it out now-and-then while he is away to exercise his horse, so I shall be able to swagger about in fine style". In fact LaTouche that morning had apologised to his wife for a dent in their family income caused by him purchasing a bicycle, a mode of transport that was to figure significantly after the earthquake on 12 June. He argues that purchase and resale of the bike would be cheaper than renting one, a notion that Oldham had recommended to him the previous year, as an attractive economic measure to acquire camels for field work in the Rajputana desert. On 4 June Oldham confirmed his arrival in Simla "My Dear LaTouche, I got up here dog-tired on Monday evening. The journey was pretty hot and the tonga more wearisome than ever. It is nice and cool at present, and no dust, as there has been a lot of rain, but it seems drying up today." After some administrative instructions Oldham indicated his intention to leave for NainiTal to avoid a time-wasting social engagement to which he had been invited. "I propose leaving here on Tuesday morning next. There is a big wedding which I should go to if I stopped, & I would rather avoid such functions while I may." In his 7 June letter, and with a hint of humour, Tom tells Nancy of Oldham's wish to avoid attending the Simla wedding. Oldham remained single his entire life and had poked fun at LaTouche earlier that year [2 March 1897. Mss Eur C258/55.9. ]"You married men are wonderful; either you get ill or your wife does, or there is a chance of one or other [contracting some illness,] & anyway, it means going in to the nearest [hill] station and knocking off work for a while. I dont know any other department where men can do that sort of thing, but then we are better off than others in many ways, and what applies to them does not to us. Don't take this as a dig [?jibe], for you are all right, it is only a passing thought". The next day, not content with the promise of exercise gained from his new bicycle, LaTouche admits to his wife that he has spent more money in his quest for fitness. He had purchased his very own set of golf clubs. That week LaTouche was busy grinding thin sections of rocks for his report on the Geology of Rajputana on a home-made grinding machine in the Calcutta office. LaTouche was the first geologist in India to make petrological thin sections, and he reports to Nancy that he had now mounted 50 sections for analysis. On 11th June Oldham arrived in Naini Tal in time to observe the effects of rain on the GSI landslide mitigation project near Government House. The day of the earthquake 12 June 1897 : It rained heavily on the day of the earthquake, in Naini Tal, in Shillong, and in Calcutta. LaTouche's letter that day describes the downpour along with comments of British military losses reported in the newspapers. He mailed his letter to Nancy just before the five o'clock afternoon Saturday post. 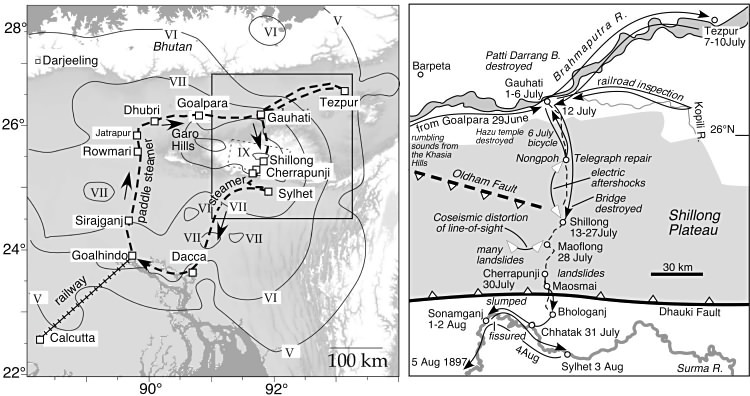 The Shillong Mw8.1 earthquake occurred at 17:11 local time, Saturday 12 June 1897, and within a minute and for the next several minutes surface waves from Shillong rocked Calcutta causing widespread but minor damage in the city (Figure 3). LaTouche was uncertain whether to reassure Nancy in Simla that he was safe with a telegram or a letter. He eventually sent both. ▲Figure 2. A collapsed portico in Calcutta from LaTouche's (1897) Nature account written ten days after the earthquake, and published 22 July 1897. In his article LaTouche emphasizes shoddy construction as the chief reason for collapse in the city. Calcutta 13 June 1897. Sunday It was really a most alarming experience. I have felt in a good many earthquakes out here, but nothing so like as bad as this one. I was lying in the sofa of my room here at the hotel, which is on the upper story, having my tea when it began, just at 5 o'clock. At first it was very gentle, just a slight rattling of doors etc, and I thought it would be soon over, but it got worse and worse until the floor of the room was heaving like the deck of a ship at sea. I thought it was time to leave then and started for the door, but remembered that I had no coat on and went back for it. I confess I was most frightened in those two or three seconds I was getting my coat than I have ever been before. When I got out on the landing I found every one getting down the stairs as fast as they could, some of the men in pyjamas. Down below it did not feel as bad, but we all got out on the maidan [the Calcutta parade ground] as soon as possible, where we could see the houses and even the trees rocking to and fro. It was a very long earthquake, lasting between 4 and 5 minutes. I might have stayed in my room all the time. There is not a crack to be seen anywhere, and there are very few in the hotel anywhere, but many houses are perfectly ruinous, and the people in them have had to turn out. One family has come into an unoccupied room in the museum. Some houses have come down altogether, but as far as I can find out, no lives have been lost. It began so gently that everyone had time to get out into the open before the worst came. One lady I hear was in her bath and had a very narrow escape. Her husband I believe let this out! Mr. Hayden's house was badly cracked, and he was afraid to sleep in his own room last night and another man had a punka [a manually operated fan] rigged up in the cow shed and slept there. I saw Sydney this morning and she said that her home is a good deal damaged. It seems to me that not one of the older houses has escaped, and most of them will hardly be habitable during the rains. About 20ft of the cathedral spire has been knocked off, & I have got permission to go up tomorrow morning and make some measurements and take some photos. I have got as many of the survey men as I could get hold of at short notice to go around and take photos, & Mr. Hayden and I have been hard at work all the morning. We went to the old cemetery where there are a lot of tall pillars and obelisks and got a couple of very interesting overthrows which will help us to calculate the direction and force of the earthquake. The old museum has suffered badly and a great many cases in our galleries are smashed in by falling plaster. I must be off now to see if the photos I have taken are all right, and get some more before it gets too dark. They begin to clean up things so quickly here that one has to rush round at no end of a pace. I am going to photo the town hall and High Court this evening. I hear they are both badly damaged. Altogether it has been a most exciting time. I think it very unlikely indeed that we will have another. It is very seldom that they come together. I am anxiously waiting for news from outside Calcutta. I wonder if you felt it up there. It has been felt in a great many places even as far as Karachi I hear. So perhaps you did feel it. Calcutta 14 June 1897. My own Darling Nancy, I have only time to write to you a very scribbly letter this evening. I have been out all day taking photos and making measurements and am pretty well tired now. First of all we, Mr. Hayden and the rest of us, as many as I could get together went to the cathedral the top of the spire of which has come down and made some measurements which were very interesting. I had got permission from Mr. Luckman the chaplain to go up on the roof. The outer corrugated iron roof has been marked in various places by falling bricks but the inside was protected by the ceiling and is scarcely damaged. Then we went off in different directions to photograph. I got 3 very good pictures and went over several houses. The damage done is enormous and it will cost lakhs [hundreds of thousands of rupees] to put it right. A great many houses ought to be rebuilt entirely but the native owners will probably only patch them up till the next big earthquake comes and then they will collapse entirely. The worst of it is the monsoon is coming on, in fact it has already broken, & most of the houses leak like a sieve. I was dining with the Sarkies last night and some heavy rain came in. The water was pouring in down the sides of the walls, and their house is by no means so bad as some. Today the streets have been full of furniture going from houses that are badly crushed to any place that the unfortunate people can find that is less damaged. The hotel is crammed full mostly from people from Mr. Mouk's other boarding houses. I determined after all to wire to you this morning as I was anxious seeing there was no news from Mussourie in today's paper, and it was said to be very bad at Darjiling. So I was greatly relieved to get your answer about 2 o'clock. Calcutta 15 June 1897. My own dearest Nancy, It is just as well that I did telegraph to you yesterday for by some chance or other there was no letter from you this morning and if I had not heard yesterday from you I should have been horribly anxious. We are still engaged investigating the earthquake trying to get as much information as possible before the rains come for a great many of the damaged house will be falling if heavy rains come and it will be impossible to say if the damage was caused by the earthquake or by the rain. I think though we have got nearly all the information we can in Calcutta already. There have been some heavy showers today and one is now going on. I have been trying to print some of my photos on blue paper [the processing technique still known as blueprints] but there is not sunshine enough. I hope to be able to send you one tomorrow. The English mail will not be in till tomorrow evening. Very late this week. I am afraid they will have an anxious time at home , for some idiot is sure to have telegraphed a secretarial report home. The account in today's "Pi"[the Pioneer newspaper] is utterly absurd. Hardly any lives, 3 at the most so far as I can find have been lost, and the damage is nothing like so great as they report. I have telegraphed today on seeing the Pioneer, to Simla to the head of the Reo. & Agril. Dept. to suggest that he should wire to the Secy. of State to contradict such exaggerated reports. I shall very likely get a wigging for it but it seemed to be my duty to do so. Calcutta Friday 18 June 1897. I have been very busy all day - out at 7 to photo a house about 2 miles away. Office grinding rocks and developing photos all day and afterwards to the maidan to take a photo of the cathedral spire with a telescopic lens we have in the office and which will show every crack in the top of it. I am glad that you had heard nothing about the earthquake till you got my telegram or you would have been anxious. I was never in any danger my dear and might have sat in my room till it was all over, but when the room is reeling about one like that it feels safer outside. Had he known of the severity of the earthquake Oldham would most certainly have abandoned his inspection of NainiTal earlier, for he considered himself the GSI expert on such matters after completing his father's articles on the 1869 Cachar earthquake and the catalog of historical earthquakes in India [Oldham, 1882 a, b). LaTouche had alerted him via telegram to damage in Calcutta, but even on Wednesday 17 June Oldham wrote postponing his departure to the following Friday, and arriving back in Calcutta as planned previously, on 20 June (see 27 May entry). Geological Survey office, NainiTal 17 June, My dear LaTouche, I have just got your letter of 15th. You seem to have done everything that could have been done except send me full news by wire and I am much obliged to you for what you have done. I have just wired that Hayden should go to Darjeeling as soon as possible. The direction you give at Calcutta places the seismic vertical somewhere about the Garo Hills or further north in the Himalayas, probably the former, and the Darjiling observation will be valuable in deciding this while the heavy rains there will obliterate the marks of the earthquake. The stations along the line will give information too but it would be well to get particulars of damage done from the G.B.R. [Great Bengal Railway] before starting. Calcutta Saturday 19 June 1897. ---It was a holiday at the office but we were all there developing photos & Mr. Hayden getting ready to go up to Darjiling to make observations. A great deal of the line is broken down and he will have to do that part of the journey by trolley, so he will not get up there till Tuesday. I developed two big photos of the cathedral with the telescopic lens and they have turned out beautifully. You can see every brick and crack at the top of the spire. I think the report on this earthquake will be the best illustrated one in existence . We must have somewhere about 50 negatives to choose from. I had a telegram from Mr. Smith this morning. They are both all right but I expect the have had a very rough time of it, though he does not say if they were turned out of their house. Calcutta Sunday 20 June 1897. Mr. Oldham is to be here tomorrow morning and will take the direction of affairs off my hands. I had a letter from him this morning thanking me for what I had done which is rather decent of him. I have been doing some printing today on bromide paper as I want to send a short account of the earthquake home to Nature by this mail, but I could get none of them quite finished (dried I mean) by the time I came here to tea. I also went to get a photo of the Scotch Kirk and the Jewish Synagogue spires with the telescopic lens but the light was too bad. I must try again in the morning. I did the very same thing this evening that I told you another man did to me the other day -walked into a perfect stranger's room by mistake and had to retire with apologies. The fun of it was that he was so like the man I expected to see that I did not see my mistake till I had spoken to him for about a minute! Mr. Hayden went to Darjiling yesterday and is probably somewhere on a trolley at this moment. He will have a very interesting journey. [ The trolley was a hand driven railcart . Hayden was evidently a good friend of LaTouche's and was to succeed him in 1911 as Director of the GSI following LaTouche's acting stewardship of the post following Holland's retirement]. ▲Figure 3. (left) LaTouche's epicentral route superimposed on an isoseismal map of the 1897 earthquake [Ambraseys and Bilham, 2003]. His "earthquaking" investigations from Gaolhindo to Sylhet traversed MSK Intensity VI-IX and were equivalent to inspecting damage along the entire length of the 1906 San Francisco earthquake (477 km). The damage of his return journey from Sylhet had been inspected in detail by his colleague, George Grimes. The inferred 1897 rupture is shown by the dashed rectangle beneath Shillong, and the projection of the inferred causal fault (Oldham fault) is shown on the right [Bilham & England, 2001]. The double-headed arrows indicate the locations where LaTouche reported co-seismic surface deformation, and electroteluric potentials induced by aftershocks. Calcutta Monday 21 June 1897. "Mr. Oldham's arrival has been like that of a bombshell. Mr. Vredenberg is sent off up to the East Indian Railway, and Grimes to Sylhet and Cachar, Hayden has already gone to Darjiling. I have been very busy all day getting things ready. Of course I shall travel as light as possible. Korba and 2 chaps will go with me"--- [Korba was LaTouche's field assistant, Oldham's former field assistant, who had been recommended to him by Oldham earlier that year as a man who, foremost among other field attributes, knew how to erect tents correctly. LaTouche had started this letter with an apology to Nancy since he knew that the looming fieldwork would delay finalizing his Rajputana report, and hence his escape from Calcutta to visit her in Simla. He explains that he has been dispatched up the Brahmaputra river to investigate damage as far as Gahauti north of the Shillong Plateau. He had worked in the region shortly after his arrival in India in 1882 and knew his way around the district.] "I am going to take the Rajputana notebooks and maps with me and work at my report on the steamer. There are so many distractions down here that I have not been able to get much of it done yet. I have nearly enough rock slides cut to keep me going for the time I shall be at Mussourie and after all I don't expect to be away more than a fortnight or three weeks. I aim to do only the stations along the river so that I shall not have to do any camping, and shall be able to go everywhere by steamer. I rather like the idea of seeing Assam again as you know , but I only wish you were with me. You are better where you are though, as there may be some discomfort owing to some dak bungalows being wrecked etc. Luckily Col. Maxwell, a very old friend of mine, is at Gauhati and I know he will do all he can to help. " The title of LaTouche's (1897) Nature article was "The Calcutta earthquake", since his experience of the event up to that time was biased, as was Oldham's, by the damage he had documented in the city (e.g. Fig.2). Reports from the epicenter 150 km to the north indicated substantial damage but were second-hand, and telegraph lines were down. On 24 June 1897 Nature summarized incoming information including the Chief Commissioner of Assam's exagerrated estimate of 4000-6000 fatalities on the Shillong plateau (the final death toll in the whole of NE India was fewer than 1600, but had the earthquake occurred at night, say 6 hours later, the death-toll would have been an order of magnitude larger). All this was about to change as LaTouche steamed towards the epicenter (see Figure 3). In one of LaTouche's letters he enclosed a sketch of the paddle steamer Afghan for his daughter Avice. Dhubri 25 June 1897. The steamer got here at 3 o'clock and I came onshore at once and went off to see the District Commissioner - a man I had never heard of before, a Mr. Halifax, he asked me at once to stay with him as long as I was here, and as the dak bungalows is in ruins - here I am. He had a very narrow escape from his own bungalow, which is the worst I have seen yet. Absolutely nothing but a shapeless heap of bricks. He was reading at the time when the earthquake came and had only just enough time to run out when the whole thing came down. His is living now, camp fashion, in a bungalow with nothing but mat walls and a timber roof belonging to the local board. Nearly every house in the place is a wreck. The doctor, an old friend of mine, is living in his stable, with a few sticks of furniture he has saved---There are two or three interesting results of the earthquake here which I shall have to investigate critically tomorrow and make plans & measurements of them. The bungalows don't help one much they are so utterly smashed up. They still have slight shocks here - there was one 5 minutes ago which shook the house quite distinctly -but the people are getting quite used to them and only say - Oh here's another (!) when they come. It is most extraordinary to see the way the ground has cracked and opened about here. All along the river banks and on the roads in every direction there are huge fissures and generally mud and water has been thrown out from them. Mr. Halifax says that a large quantity of the crops have been destroyed in his district and there will very likely be some famine but I hardly think from what I have seen of the crops coming up the river that they can have been damaged much. Nancy's daily letters to Tom are also archived in the British Library but are in general lean on science and full of family matters. LaTouche explains that despite his instructions her letters to him are not being forwarded from Calcutta, and that as a result he has not heard from her for a whole week. In fact, the misdirection persisted for two whole weeks until 4 July. His letters to her, however, continued daily. 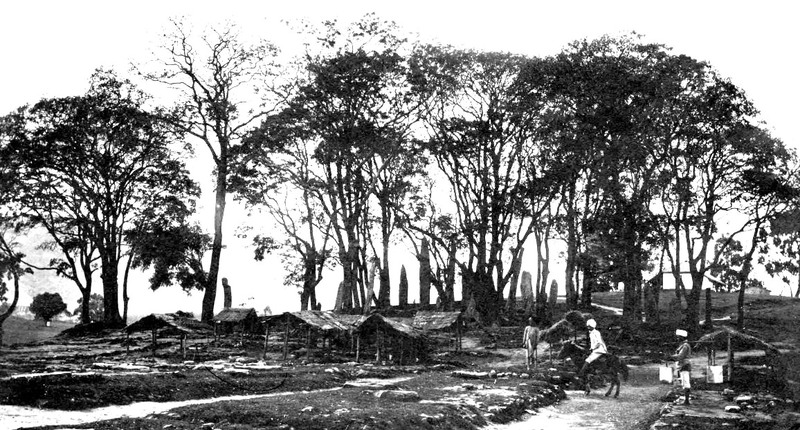 Dhubri 26 June 1897. I did a great deal of work here this morning and made some measurements but most things are so entirely broken up that we cannot make much out of them. There has been a good deal of rain today which has made it much cooler. It was a very hot night last night but I got a good deal of sleep all the same. We are to dine tonight with the forest man Mr. Campbell. He is only lately married. I remember his wife as a little girl 16 years ago up at Tura. Her father was doctor there and pulled me through my first bout of fever. Dr. Halifax is waiting for me to go over to the club with him so I cannot write to you much of a letter. In his official report LaTouche states: From a letter written after the earthquake by the Deputy Commissioner, Mr. Hallifax, to the Commissioner, Assam Valley District, dated 24 June 1897, I obtained the following particulars: At Gauripur, 5.5 miles to north of Dhubri, pucca buildings and bridges were all destroyed and low-lying places filled with sand. The time is given as 4:30 pm. At Sukhchar (25°32'N,89°55'E) the thana is said to have sunk 4 cubits. The river which was 30 feet deep before theearthquake was choked with sand within 8 feet from the surface and heavy floods occurred in consequence. At Bijni (26°30'N,90°45'E) sand and water were forced up to height of 4-5 cubits. Oldham, 1899, p. 261. Goalpara, 29 June 1897. I took some photos this morning of the place, and have been reading all the rest of the day. It has been too hot to work. There have been slight shocks every now and then but I had a very good sleep last night and was not awakened by any of them---. The Jowetts came to dine here yesterday. They are very uninteresting people. The letter I had today was from Mr. Ibbetson at Simla "Very many thanks for sending me the earthquake photos. It was most kind of you to think of it. I have shown them to the Viceroy [Bruce], Sir J. Workman, & many other people, who have been greatly interested them", which is very satisfactory. There's another quake, rather a smart shock. That makes 18. It is a weird sensation hearing them coming and wondering whether it will be a strong one or a merely a noise, but they are very soon over. In his official report (Oldham, 1899. p.263) LaTouche states:"At the time of my visit slight shocks of earthquake were very frequent. As a rule each shock was accompanied by a more or less booming sound, apparently proceeding from the SSE, and generally heard slightly in advance of the shock. Frequently the sounds were heard without any shock following, and they then resembled very closely the well known "Barisal Guns" [LaTouche T. H. D., (1889), On the Barisal Guns Proc. Asiatic Soc. Bengal, 111-112.] , though they were not so sharp and well defined as I have head them in the SW portion of the Garo Hills. Oldham (1899) p. 81. calculated from the projection of structures flung from their former positions at Goalpara, that the maximum ground velocity in the earthquake exceeded 3.3 m/s. On page. 262 of Oldham (1899) LaTouche depicts the destruction of the tomb of Ensign Law. He shows that the top 2 m of a stone pyramid is thrown 3 m northward from its 1.7-m-high, 63-cm-wide pedestal, over its surrounding railing. Gauhauti 1 July 1897. Well here I am at Gauhati again after so many years. The last time I saw this place, I was thinking continually of you my dear, and so it is connected in my mind with you. It is looking just the same as usual from the river and its only when you walk about and look at the houses, or what were houses, that you see what a lot of changes have been done. I am living with most of the sahibs and mensahibs in the Chief Commissioner's yacht, which is the only place they have to live at present, but they are having tents put up now. The District Commissioner, Captain Gordon is not here but Mrs. G welcomed me and is looking after me. She is another of the McNaught family, and has an unmarried sister here with her. They are all very much like each other, very pretty and considering the way must have been brought up, wonderfully nice and ladylike. Indeed there is a high bred look about them all which one can't help being surprised at. I don't exactly know how many more of them there are but I believe there are several. There is also a Mr. and Mrs. Bill on board. He is steamer agent here, an oldish man, and she is an oldish woman, stout and grey-haired. Then there is a whole lot of railway men, not very interesting. We bachelors (!) have one cabin and bathroom to dress in, and all sleep on deck. I went round this morning and saw a lot of the damage and found some interesting falls of gate posts etc. Gauhati 3 July 1897. I find my bicycle very useful here as there are some pretty good roads and I can ride along and see what are the best things to examine. The DC's head clerk has just been here showing me the reports received from outlying places in the district. Some of them are very amusing: one man says that "frightful rents formed themselves in the ground eating up the things (cooking pots, etc.) in many families", that "Topstones of some hills have fallen down and some places have emanated red earth and ashes"! In places the crops have been half destroyed by sand and floods, and it is very likely there will be a famine in some parts of the province. It is a great blow for poor Mr. Cotton. He was going to do such great things to develop Assam and now he will want all the money to be had to rebuild the stations, and roads and bridges. The babu told me today that a temple not far from here, at least 300 years old, is destroyed. 5:30 am: I meant to have written to you yesterday evening but went for a bicycle ride instead out along the Shillong road to see what it was like. I came across two bridges which have been damaged by the earthquake and will have to be rebuilt. I should think you are getting very tired of hearing about the earthquakes aren't you? It is still the principal topic of conversaiton here and everywhere else in Assam and Bengal and I suppose it will be until the people get settled some way or other. I am going out to do some photos this morning. It is a good morning for it - rather cloudy and no wind. The weather here the last week has been most extraordinary for the rains. There has been so much haze about. I have asked Mr. Oldham if I may not go back to Calcutta through Shillong and Cherrapunji. I believe the road is open nearly the whole way now and I should like very much to see what damage has really been done. I don't think Mr. Smith did very much except take pictures of buildings that had quite tumbled down, which are not much use from a scientific point of view. Oldham welcomed LaTouche' suggestion to return south from Gauhati, crossing the Shillong Plateau and the epicentral region through the hill stations of Shillong and Cherrapunji (Figure 1). 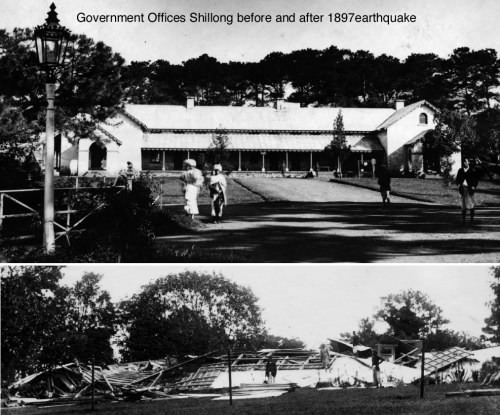 Oldham's concern was that the report from the GSI geologist Frederick Smith and his wife who had been in Shillong during the earthquake, was quite unsatisfactory for quantifying its effects. In his letter Oldham requested that LaTouche obtain a set of before/after photos of the Shillong region. 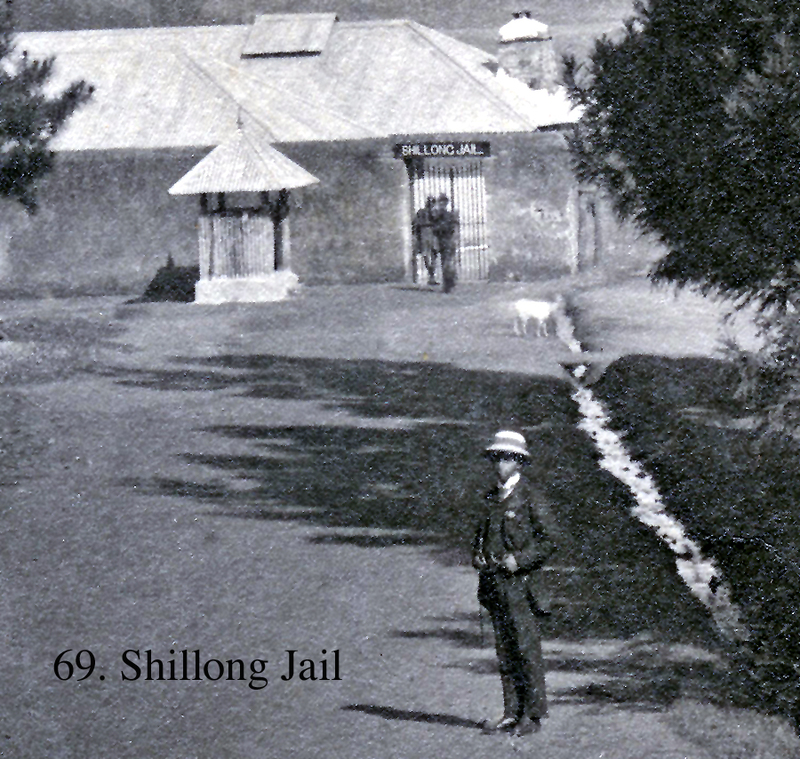 Many of the before/after photos of the Shillong region used to illustrate the present article are from an album found in a UK bookshop that had been assembled from the same source as the photos used by Oldham in his 1899 memoir. My Dear LaTouche, I just got your telegram and am glad to hear that you were willing to go to Shillong and Cherrapunji. I have not got Smith's written report yet but from what he says I see he has missed an opportunity to join you and work it out. I got a letter from Watts, the engineer, enclosing a record of the gauge readings of the Brahmaputra at Gauhati, which show a sudden rise of 8 feet immediately after the earthquake and gradual fall afterwards. This is partially due to falling-in of the banks. I would be glad if you would enquire about it. When in Shillong get a set of photos. There are two babus who have been photographing. Order a complete set, or leave out such as you think has nothing to do with the earthquake, to be sent to me. Very likely I will order more copies of some but that can be done afterwards. Also try to get photos of the monuments and buildings as they were before the earthquake. I have some other evidence, in letters of Barisal guns occurring with the earthquake shocks but they also are said to occur without, and to have been frequent before the big earthquake. The evidence will want careful sifting, however. You are not altogether out of luck in being away from Calcutta. The weather has been just awful - there is no other word for it - since you left, bar the first two days, and today is as bad as any of them. Gauhati 4 July 1897. I shall probably go to Tezpur on Tuesday, and then if I don't hear of anything worth seeing higher up the valley, I shall come back here and on to Calcutta, via Shillong and Cherrapoonji. I had a telegram from Mr. Oldham today to say I had better go that way, and I am very glad of it for I should very much like to see what those places are like. I have pretty much finished the earthquake work here and this morning took it easy, but tomorrow I want to ride some distance up the Shillong road and to see what the bridges are like. I developed some photos taken here last night and they have all turned out very well. It is hot work in the stuffy little bathroom on board the boat. After I had done I went up on deck to go to bed at about 1o'c but could not find my bedding anywhere and I had to come down and sleep on a couch in the cabin. I found this morning that Korba had put my bedding down on the wrong part of the deck, and the canvas screen, behind which Mrs. G and Miss M. sleep, was put up afterwards so that it was inside. I hope your hat was a success and knocked all the others in church. It is such a comfort to be getting your letters again. Gauhati 6 July 1897. I had a 60 mile ride yesterday up into the hills along the Shillong Road. I went as far as Mungpo, 30 miles from here, and back again in the evening. The road is an excellent one but of course there are some long hills which I had to walk. I am feeling quite fresh and jolly this morning and had a first rate sleep last night, In fact I went to sleep immediately after dinner which I don't often do. This will account for my not having written to yesterday. What with one thing and another [?packing] I have been kept busy all day and I am writing this by the light of my bicycle lamp on board the steamer. I have just ridden down from the yacht and shall sleep on board here as she leaves at 5 in the morning, We get to Tezpur tomorrow afternoon. Capt. Gordon the DC came back yesterday afternoon, which I was very glad of as I wanted to talk to him about the earthquake. He has been making a tour through his district with Col. Maxwell whom I also saw today. He is not a bit altered since I saw him last. You know I have known him ever since I came to India, so he is an older friend than even Mr. Fisher. I like Capt. Gordon very well. He is a great relief after seeing so much of these railway men, some of whom have very little manners. Tezpur 7 July 1897. The steamer has been going since 5 this morning and we ought to be in Tezpur in an hour or so - just 5 pm now. The current is very strong up here and she does not get along very fast. Tezpur 8 July 1897. I went out this morning to see what I could in the way of things thrown down by the earthquake, but I could not find much. The east end of the church has been knocked out and some buildings are badly cracked, but none have come down entirely. Tezpur 9 July 1897. I took a photo of the church this morning and walked round looking for things measure but could not find anything. Col. Gray lent me a letter to read written by a man whom the C.C. sent out to Cherra soon after the earthquake to look after the people. It gives an extraordinary account of the ruin along the road. For miles and miles the whole of the road is utterly gone and all the bridges and rest houses are smashed. The unfortunate clerks (European) at Shillong who had been investing their savings in houses have lost everything. I have not had the least touch of fever yet, I am glad to say and hope I won't get any of it. So far I have had no real hardship. Plenty to eat and drink and a good roof over my head at night but I don't know how it will be up in the hills. However you may be sure I shall take good care of myself and I have plenty of quinine and chlorodyne. I had a letter from Mr. O. yesterday [the letter Oldham wrote to him 3 July] . He says the weather has been awful and that I am lucky to have escaped it. It is well that those riots did not come on while we were going about earthquaking. Gauhati 12 July 1897. In the afternoon I had to pack and send my things off to Shillong with Bhola and Janat Ali. Korba will go up tomorrow by tonga. The road is open the whole way now. This evening I am going out on the railway with one of the engineers in an engine to see what it is like. They have got it open for about 40 miles from here. I should not wonder if government gave it up all together Here comes Korba with my [?chile] and I must eat it and be off. I have been out all day on the railway which is really worth seeing. I went out 40 miles from here [LaTouche travelled eastwards as far the Kopili River, see Figure 3] in a train starting at 7 this morning. Every here and there the embankment has sunk down and the rails are all twisted, but the engine somehow or other gets along. Of course we went very slowly, only 4 miles an hour or so over the bad places . It is very interesting to see how the bridges have been affected by the earthquake In fact that is what I went out to see. In his report (Oldham 1899, p267) LaTouche writes "I went out along the Assam-Bengal railway as far as the bridge over the Kopili river, about 41 miles from Gauhauti. The rock cuttings, in gneiss, have not been affected in the slightest degree by the shock, but where the line passes over alluvium, the embankment has settled down carrying the rails with it. Many of the culverts are badly cracked, apparently from the same cause that has affected the bridge at Gauhati, viz the fissuring of the banks of the streams and the subsequent sliding forward of the abutments and wing walls. The piers of the large bridge at Kopili are cracked through horizontally at about 2 feet above the ground level, and the girders have shifted lengthways on top of the piers. The bridge runs east west." ▲Figure 5a. An 1897 tonga, a horse and buggy, used for transport in the Khasia Hills and Shillong. 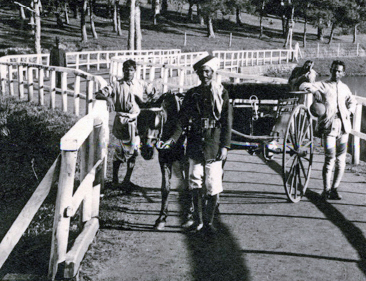 Shown here approaching the bridge near Ward Lake, Shillong before the 1897 earthquake. Calcutta 12 July 1897 Geological Survey Office. Oldham to LaTouche. Mss Eur C258/55.15. My Dear LaTouche, I got your letter of 8th and 9th yesterday, and sent a telegram to you, directed to Shillong yesterday. Smith forgot a lot of things at Shillong, especially to take measures of the overturned monuments, I also want to know the dimensions of the seismometer cylinders. I fancy they are the same as those in the appendix to Mem. XIX  , but there is no record of this. I was interested to hear of the twisted monuments. I hope you took the old and present bearings of all. I don't know whether you know that with enough observations one can get a very good direction out of them? Grimes has gone from Silchar down the A. B. Ry. leaving Sylhet for the present, so you had better take it on your way down and I will send Grimes to Serajgunge. Yours sincerely, R. D. Oldham. PS You might drop a line to Grimes, c/o Station Master Chaudpur, A. B. Ry, telling him about Serajgunge and how to get there. ▲Figure 5b. The road from Gahauti to Shillong was fissured during the earthquake, and in some locations landslips had blocked the road and brought down telegraph wires hindering supplies and news to-and-from the epicenter. A letter from Shillong in the Centre for S.E. Asian studies in Cambridge provides an eyewitness account of the earthquake, which I supplement here with contemporary photographs of damage. It was sent by Mrs. M. Sweet to her sister while LaTouche was heading for the epicenter on the Brahmaputra steamer. Mrs Sweet mentions many of the same people that LaTouche encountered in his two week stay in Shillong, 13-27 July 1897. Shillong, 28th June from Mrs. May Sweet to her sister Mrs. Godfrey. I write to you as you know Shillong so well it will be easier to tell you about it all. It is wonderful that I am alive to write about it at all or anyone else. If it had happened in the night, a few hours later, hardly anyone would have been left alive, it was all so horribly sudden. At 5.30 on Saturday last, the 12th June was as usual, and 30 seconds afterwards was completely in ruins. I was riding on the Gauhati Road with Mr. Monaghan and suddenly we heard a queer rumbling sound and then trees swayed every way. Luckily by instinct we both turned sharply to the left and galloped up the hill as far as we could and find a place. We had crossed the bridge which would have gone down under us (Fig 6). I can't possibly describe the sensation as it was so totally different from anything I had ever experienced. I did not know whether I was on my horse or not or on the land or in the air. I could do nothing as the ground was all in a whirl. I know I looked once at Mr. M. and he was as pale as death. We neither of us thought of an earthquake, we thought it was a landslip on the Gauhati Road. Of course, when we got up to the mission we saw something of the terrible ruin, the poor missionaries, they were all on the road with their houses flat on the ground and old Miss Jones in a dying state. We stopped to make her as comfortable as possible and then rode on towards the station (she died a day or two afterward). We could not go by the ordinary way until we got to the ground as it was all burst open-and there were continued shocks the whole time. It was terrible riding home. Until we got to the bazaar I never realized what must have happened in the [hill] Station. [ Fig 7]. ▲Figure 6. Collapsed bridge outside of Shillong thrown from its abutments by the earthquake. Mrs. Sweet and Mr Monaghan had just ridden across it. In his official report LaTouche states: "The large bridge on the Gauhati road about 1.5 miles from Shillong, over the Umkra River, has suffered severely. The abutment on the SE side fell entirely carrying the girders with it. The two piers and the abutment on the northwest side which are of more recent construction, remained standing though somewhat cracked. (Oldham, 1899. p271). The many in the pith helmet is probably Mr. R. S. Strachey who appears alos in Figure 23. ▲Figure 7. The Shillong Bazaar before and after the earthquake. ▲Figure 8. The bridge across the almost empty Ward Lake in Shillong after the 1897 earthquake, and in 2003, reconstructed with lateral stays. The dam holding the waters of the artificial lake burst in the earthquake, killing Mr. J.W. Rossenrode, a retired surveyor and a child. Everybody we passed looked dazed or almost wild, looking for others and their children - I felt dreadful too, though I knew Jack was out with the Ayah and a friend and his son. And then I've come up here to see my house, “Yogedan” was on the ground, literally there is not a stone left standing on another in the whole Station, one or two kutcha houses are half standing but unsafe. Poor Mr McCabe, we heard how he was buried when riding home but could not believe it. -Mr Rossenrode also and a little child carried away when the lake burst. Oh, to see the desolation of the place now and the lakes, the whole of the water emptied out in a few seconds-To make matters worse and it turned cruel-we had a pelting wet night. I believe some people had an awful time-could get nothing to eat and got soaked at night. I was very lucky I heard that Government house had one of the tents up so I went up there and asked the Cottons to take me in. They were very kind so I got the kiddies and we stayed there 2 nights. Also Mrs. Arbuthnot's children and Nurse. Mrs Campbell, Mrs Horn, Mrs Hawthorne, Duncan, Nightingale and Burkes. We had an awful squash. Very wet and hardly anything to eat (though we did not feel inclined for it). ▲Figure 9. Mrs Nightingale's cottage after the earthquake. We all sat up all night and rushed out for our lives at every shock. It was an awful experience and I never want to go through anything like it again. Luckily Jack kept well all through and I have been able to get milk for him. I don't know what we should have done without Mrs Horne. That first night and day she was splendid, fed us all and provided blankets and her house, being Kutcha,was not quite down. She could get something out otherwise we should have starved. Mr and Mrs Cotton quite lost their heads, poor things. I fancy they have never roughed it in their lives before- It is dreadful, we have had continuous shocks ever since and yesterday (Saturday at 5.30 we had another very bad one which would have been quite enough to bring down any building) - the natives predicted one a week after. We also had two very bad ones last night and hardly anyone has got undressed at night. I think a lot about the first. I did last night and had my dressing on ready to fly into the open- it is terrible living for over a week in a continual state of fear. Some peoples nerves have entirely gone-mine are bad enough and I am not surprised at anyone getting heart disease. Today we've had very few shocks and hope they are nearly over-but they are always worse at night. The only thing is, I and several others can't sleep and it is wonderful how one can keep up with so little. For a whole week I one night slept from 11.30 till 3.30 and early this morning for an hour. I was thin before but now am only skin and bone! However it is nearly over and I hope we all feel we might be only too thankful for our lives. The Kings and Mrs McCabe and Mrs Trotter are all with us in a little camp here. Up to last night Mrs McCabe, the Kiddies Ayah and I were in the Buggy shed which was leaning right over but it had not gone as it was built of wood, but is luxurious compared to others. A great many people are in the back sheds and have two or three sharing a mattress. Another awful thing was that the water supply ran out and there was a fear of Cholera breaking out. Dr Campbell quite thought one of my grass cutters had it. We send to the pologround for water. Potatoes too were scarce as everything was buried but they are being dug up by degree and they say that in a few weeks the road will be made for fresh ones to be brought up - of course everything was an awful price. The ponies are fed on 1 seer pack or turned out to grass. Pearl behaved beautifully all the time. The only way they kept their feet was that they galloped. I really am most comfortable now for have got bashas built and I suppose we'll have to live in them for months. Every day we dig a few more things out of the bungalow also it is very slow work. Still I have a good many things that are presentable after being cleaned. There were some very narrow escapes. The Cottons narrowly escaped being crushed. [see LaTouche's 14 July entry]. Mrs McCabe is still in my basha. She keeps up wonderfully- what an awful time for her. She wanted to go Mr. McCabes funeral but was not allowed - it would have been terrible. They could not get a coffin so he was buried only in a sheet and the grave was full of water. The men said they had never seen such a terrible funeral. ▲Figure 10. 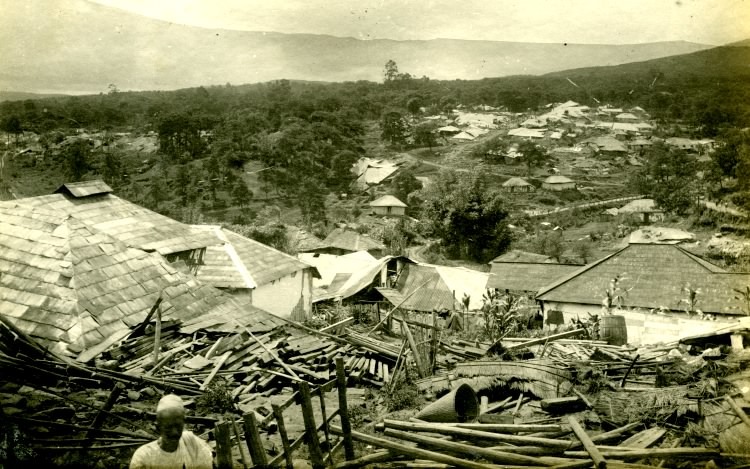 Foreground, recovery of damaged materials; background, flattened buildings, Shillong after 1897 earthquake. Mr. Gordon and Mr McClean (brother of Norman's fiancee -ex Gauhati) in their escape were both having their bath and ran on the road absolutely naked, someone gave one a coat and the other some native cloth (there has just been another shock. I wonder when they will cease or if all our hair will be grey by then!). It was in an awful way as you can imagine as to whether Dibrugarh had gone or not. I could not hear for days and not a wire as all communication was destroyed. Thank goodness it is alright-tho' Willie says they had a severe earthquake. He could not stand alone but no damage was done in Dibru itself. It's plenty round about Cherra, it seems to have been worse than this. Whole sides of mountains have absolutely disappeared. Mr. Cotton has telegraphed Willie to come up. I'm afraid everything you had here has now gone completely and that lovely sideboard in Gauhati - and in getting to write to you he is afraid there is no chance of the piano being dug out whole. I don't know when they will talk of building things up again. Everyone will live for months at least in bashas. Till then I shall manage to keep cheerful somehow and I shall not mind anything else as long as Jack [her son] keeps well. Goodbye, I never thought that first night I should see any of you again. I think everyone expected the ground to open and swallow us all. Willie [her husband] spent Sunday the 26th at Shillong-going back to work on Monday- walking 10 miles a day. May Sweet. ▲Figure 13. Ruins of Government house after the earthquake (photographed by Chakravarti, reproduced by Oldham 1899 Plate 18, Figure 20 ). LaTouche had arrived in Shillong late on 12 July, two weeks after Mrs Sweet's letter had been written, and as indicated in Sweet's letter there were no houses standing. People were living in the sheds where horses were normally quartered. 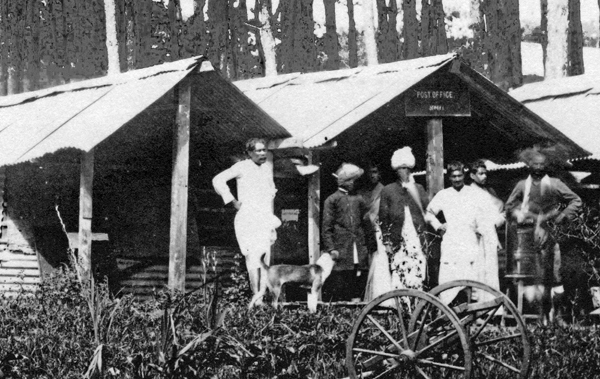 LaTouche staying in a tent located in Colonel Maxwell's grounds west of the Cricket Field in Shillong, roughly1 km west of the Public Works Department where he eventually devised and operated a seismoscope. Many of the places he visited can be identified on the 6 inch-to-the-mile map of Shillong (Fig 14). Shillong 13th July 1897. My darling Nancy, Here I am in Shillong again after many years and I only wish you were here with me though perhaps under present circumstances it is just as well that you and the children are not here. The place looks much as usual at a distance though the trees have grown a great deal since I was here and it is only when one gets among what used to be the houses that one realizes what has happened. The walls and chimneys of all the houses are simply shapeless heaps of stone. I am staying with Col. Maxwell, living in a small tent while he is in one of his servant's houses. His bungalow has not fallen as it was built of lathe and plaster, but the chimney came down and wrecked the whole of the inside. The whole house is leaning to one side like a house in a nightmare. I got away from Gauhati at about 6 yesterday morning and I rode up to the half-way place, Mungpo, where I had breakfast. It started raining soon after I left and continued pretty much the whole way, but Korba who came on in the tonga with my bedding & some clothes caught me up at Mungpo, so I changed at once and took his place in the tonga leaving him to bring on the bicycle. He has just arrived. (3:30 pm on the 14th). I could not finish this last night and anyway it would have been too late for the post. This side of Mungpo there had been a great many landslips especially in the last 8 miles but they had all been cleared sufficiently to allow carts to pass so we got here about 5:30 pm. At about 15 miles from here a young fellow from the Forest Dept. who has been working along the road down below, got into the tonga very ill with fever and congestion of the liver. He looked very bad and felt the shaking of the tonga very much, but I hear he is much better this morning. The last big bridge on the road about 3 miles from here is entirely gone, so the [?path] has to go round about 4 miles to get across the temporary bridge higher up the river. This morning Col. Maxwell and I walked round to take a general look at the damage, and then went to breakfast at the Gaits'. He is Secretary [to the Government. Gait wrote an official report about the earthquake a month after LaTouche's visit (Gait, 1897)]. They are living in a little kutcha built cottage in their compound which has stood up very well. After that we went to see the Chief Commissioner. Mr. Cotton and I had a long talk with him and expounded my views on the shock. He had been reading the reports on the Cachar earthquake of '69 [Oldham, 1882] and was full of seismic verticals and other technical terms. Tomorrow I must begin taking measurements in earnest. There are a good many interesting things to be seen in the cemetery where several tombstones, great heavy blocks of marble or granite have been pushed sideways or twisted round and I have seen several gate pillars which have been thrown over. Mr. Smith apparently missed a great opportunity here for he only took photos of some of the houses and made no measurements of things like gateposts which tell one much more about the shock than any number of wrecked houses. I expect our report on this earthquake will be the biggest and best illustrated on record. It is most extraordinary that so few people were killed here, for by all accounts the houses came down with a roar almost at the beginning of the shock. Of course there were very many narrow escapes. Colonel Maxwell was hit by a stone from a falling chimney, and he told me of four children who were having a tea party who were saved by their nurses picking them up and rushing out, just as the chimney fell smash on the table they were sitting at. Mr. Cotton gave me a graphic account of his escape. He and Mrs. C. were in the porch of their house just going for a drive, & when the shock came the horse bolted, and just got them clear as the porch came down. Most people are now building small temporary shelters to live in till the end of the rains, and some are making themselves comfortable in tents [, and are] having the floors boarded. Altogether I am very glad I came up here though it is sad to see the place as it is. They are all talking of removing the place 1000 ft higher up the hill where it ought to have been built at first. If they do that in another 20 years or so it will be a really fine hill station. I got your dear letter of 7th this morning and I am very glad to have escaped all the row in Calcutta. You might to tell Mr. Spring that the church is now an entire ruin [Figure 17] and of course the [?furniture] and windows are totally smashed, but the tombstone is not much damaged. ▲Figure 14. 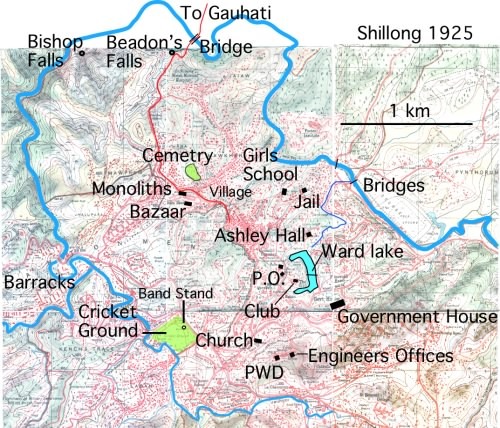 Part of the 6"=1 mile map of Shillong showing some of the locations mentioned by LaTouche. Click named locations on the map for links to contemporary photographs. Views of the regimental barracks and the village are from before the 1897 earthquake. The view of the landslips near Beadon's falls is from LaTouche's Plate 29 (Oldham 1899), all others are from Roger Bilham's personal collection. ▲Figure 15. Gravestones in the cemetery in Shillong were tumbled, shifted and thrown (Photographed by S. K. Chakravarti). LaTouche chose simple shapes to document, whose measured shifts in position provided quantitative estimates of acceleration and ground velocity [e.g. Plate 33, Oldham,1899]. Oldham returned in the dry season after the monsoon and documented further evidence of projected, snapped and displaced monoliths. ▲Figure 16. All Saint's Church before and after the earthquake. Shillong 16th July 1897. I have been pretty busy today measuring gateposts and such all the morning and rigging up a seismometer this afternoon. It is a rough sort of a thing made up of a lump of stone hung on a wire for a pendulum, a few pieces of tin cut out of a biscuit box, a slip of bamboo and a glass bead from a necklace I routed out of Golam Hyders's shop [Golam Hyder was a wealthy merchant who had settled in Shillong]. It is not put up yet as I am getting a small hut built to put it it, but I hope it will work. Several babus tackled me when I was out this morning and wanted to know if the place was safer or whether it would disappear one fine day. I always tell them it is as safe as any other place. These continued shocks keep them in a state of panic. Shillong 17th July 1897. ---there is a counter attraction in the shape of cricket (Figure 17), though I don't think I shall go to it. I know so few people here now. Col. Maxwell generally plays but he is very busy today and cannot go. Just imagine Mr. Cotton stopping all games, as far as he could, for a month after the earthquake, at least he would not allow any of the civil officers to play. Shillong 18th July 1897. I have my seismometer put up and am now sitting waiting for an earthquake to see if it will work properly………There's a little shock now but I'm afraid its too slight to affect my pendulum. Yes it did move, but too slightly to show anything definite. ▲Figure 17. LaTouche's record of two Shillong aftershocks on 18th and 19th July 1897 were enclosed with his letter to Nancy on 20 July. The scale is added in this reproduction. He omitted a schematic of his device, but may have sent one subsequently after Nancy expressed interest in its design - see her 22 July letter). If he did the letter is not among those preserved in the British Library, and Oldham omits all mention of LaTouche's ingenuity in his 1899 memoir. Three days later in a letter to his father LaTouche includes a third seismogram from an 06:50 aftershock on 19 July and attributes the design to Ewing [Rev. J. D. LaTouche, 1897]. In this letter, which his father had forwarded to Nature the estimated amplification factor is 6.7. Shillong 19th July 1897. This morning I had a long tramp down to the Bishop's Falls to photograph the landslips there and did not get back to breakfast till nearly 1 o'c. Then all the afternoon I was making prints of the earthquake diagrams I got with my seismograph which is a great success. This morning we had a real good shock at 20 minutes to 2 which woke me up, and I at once got up and went to see if the machine had acted and found a nice little trace of the shock. There is a needle in it that makes a trace on a piece of smoked glass. Then again at 10-minutes-to we had another pretty severe shock, which also registered itself, and during the day there have been several of them. I must be off to bed now, so good night my darling. Shillong 20th July 1897: morning. There was another good shock this morning which my seismograph duly registered, and then there were one or two smaller ones at night. I send you one of my earthquake diagrams . It shows how the ground moves but is magnified about 6 ½ times. So you see these shocks are very small affairs really. You tell me of your seismometer. Why did you not make me a sketch of it? Is it because I have never made a sketch of the drawing room for you, or of the view from the house? Shillong 22nd July 1897. We have only had slight shocks today. Neither of them any good from my point of view as they have hardly any effect on the seismograph, but perhaps we shall get a good one tonight. There - a slight shock at 6:26 pm. Shillong 23rd July 1897. I have had a pretty tiring day. I have finished the new seismograph, but the hut for it is not entirely ready yet, and I doubt whether it will be built by tomorrow evening which will mean I have to stay here till Monday---. I shall have plenty of work to keep me going in Mussoorie and can do it there just as well as in Calcutta, so unless Mr. Oldham is cantankerous, and I don't see why he should be, I should be able to get away to Calcutta in a week or so after I get there. ▲Figure 18. 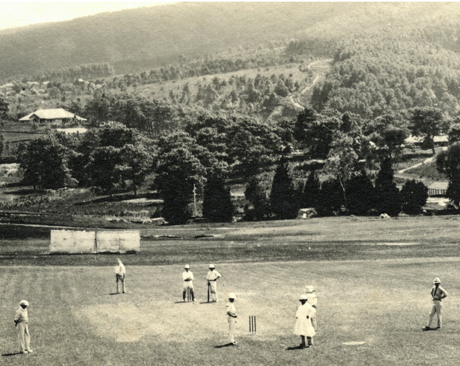 In deference to the tragedy, cricket was banned by the Chief Commissioner at Shillong following the earthquake. The restriction was unpopular and the order was rescinded in late July. ▲Figure 19. 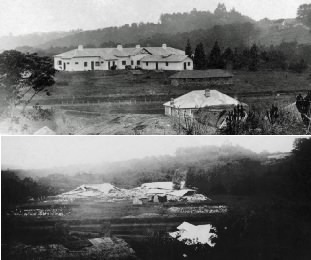 The girl's school in Shillong and foreground dwellings before and after the 1897 earthquake. Had the earthquake occurred during school hours, the loss of life in Assam would have been an order of magnitude higher than the 1500 reported. The earthquake occurred an hour before nightfall after heavy rain that had been falling earlier that day, and most people were serrendipitously outside during the shaking. Shillong 24th July 1897. I have been working all the afternoon at my earthquake report, drawing out the plans of the gateposts all to scale, and I think I shall go out and have a bit of a walk. A cricket match as usual on a Saturday has been going on just below the house all the afternoon, but I cannot see the field on account of the trees. The Ghurka pipers are just now playing a Scotch reel. They and the band take it in turns to play. As soon as the band stops the pipers strike up and they play very well too. [The band stand is shown on the map of Shillong, Fig 14] I got off my letter to father today- 3 sheets! [on receipt of the letter, dated 23 July, his father forwarded it to Nature on 18 August, who published it 9 September- Rev. J. D. LaTouche, 1897] and another to Prof. Haddon telling him that an ethnologist is wanted to come out and study the manners and customs of these hill tribes before they get more civilized. It ought to be done at once for already many of their old customs have been given up and in a few years they will be just like any other natives. I wonder if my letter will have any effect. There is a very absurd article in the Spectator on the earthquake, imagining all sorts of things; that the natives will become more discontented with our rule in consequence of it, and making generally the worst of it. They talk of a crore [10 million] of towns being leveled (!) and have evidently taken the exagerrated telegraphic reports seriously without waiting for the facts. I must send it off to you. 25th morning. It is a fine bright morning but there are a good many clouds still hanging about. I hope to do a good stroke of work at my report today. I have just been down to my seismograph to see if it registered any quakes during the night, but there was only a very small one. I think it came about 2 o'clock. It will be rather a pill if there are no more good shocks after the pukka instrument is put up. Shillong 25th July 1897. I have been very busy all day at these plans and have a good number of them finished so I am feeling good! They take rather a long time to do but it is not difficult work. I only hope that Mr. O will appreciate it. There has been a heavy shower of rain this afternoon, and I expect those people who went up to the peak to have a picnic have got wet. Col. Maxwell and I had a walk before breakfast up to the military water works about 2 miles from here. It was very pleasant walking through the pine woods, with the pine needles underfoot. There was a fairly strong earthquake shock about an hour ago (6 o'clock) but I don't think could have had any effect on my seismograph,. However, I must go and see. No, it has only moved the slightest little bit. The Khaisas said that there was to be a big shock at 5 o'clock today but it did not come off. Where they get these ideas from I don't know, maybe they are traditions of former shocks. There's 7 o'clock just struck & I want to change and go out for a stroll before dinner, so good bye for the present my dear. ▲Figure 20. Left: one of LaTouche's detailed drawings (from Plate 33 in Oldham, 1899). He numbered the placement and drew the trajectory of individual blocks. Right: the reconstructed monument in 2003 still standing in the grounds of the Shillong Club. 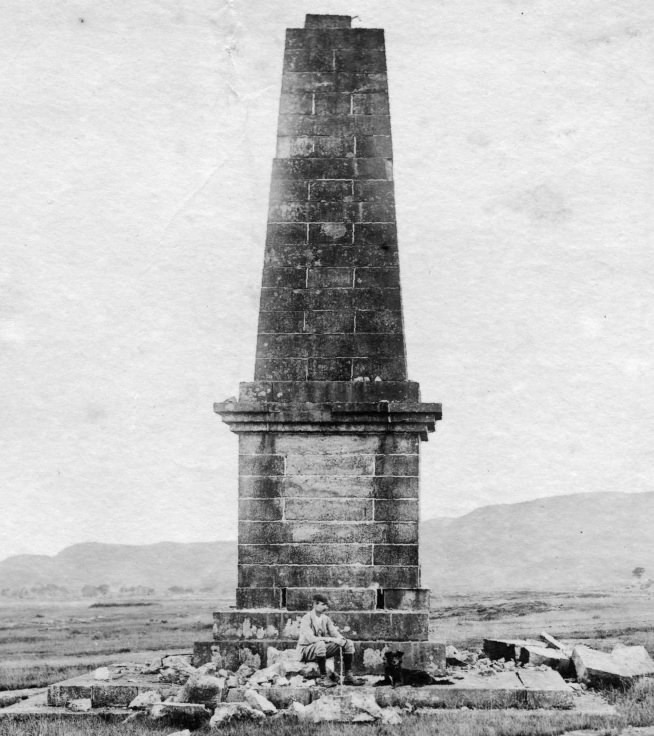 The obelisk was erected 4 July 1886 in memory of T. J. Willans a former Executive Engineer for the district). 26th morning: I have just come back from the PWD office where I have been to see how my seismograph shed is getting on. They say it will be finished today so I hope to get away tomorrow. It is a very hot bright morning. I must go off now and see the Chief Commissioner as I promised to do before I left, and tell him about what I think of the earthquake. The post does not seem to have come in yet, at any rate Bhola has not come back from the post office [Figure 21]. I shouldn't wonder if there has been a slip somewhere in the road after yesterday's heavy rains and that the tonga can't get through. I am going as far as Maoflong tomorrow, about 12 miles & on to Cherra the next day. I hope it won't rain very much. Now I must go and see the "old man" as he is usually called. Shillong 27th July. I think this will be my last letter you will get from Shillong and I am sure you will glad to hear I am on the move again. You must have thought that I was never going to get out of this , but it has not been my fault, dear, and I am as anxious as you are to be getting nearer to you. This delay here has been most aggravating and has tried my patience a gopod deal, but things are so much at sixes and sevens that it is difficult to get anything done at all. The poor Exec Engineer is pulled every way by difficult people each wanting him to do something in the way of building or repairing for them, and as he is a kind hearted fellow who can't say no to anyone, he has had his hands full. I am up in pretty good time this morning 7o'clock striking now. First of all I have to get my things packed, then go to the stores and get a few things to take out with me (biscuits, tea etc) then to the P.W. D. to put up the seismograph. The hut for it was not quite ready yesterady evening. I shall start myself after breakfast as I have only 12 miles to go and a rode that I can ride along most of the way. It is a fine bright morning but I should not wonder it is not raining out towards Cherra. I had a long talk with the CC yesterday about the earthquake of course, and told him my views about the cause of it. He has made himself rather unpopular here by the way he behaved after the earthquake, as he seems to have lost his head in a way, and sent out all sorts of exaggerated reports to the Govt. of India before trying to find out whether they were true or not. I found him very genial and pleasant to talk to . Now I must go and pack up as the coolies have come, so good bye my dear. 27th July Maoflong. My own dearest wife, I am sure you will be glad to see a different heading at the top of my letter & to know that I have left Shillong at last. It was all I could do to get away today but I was determined to do it. First of all the coolies Korba brought said the road was so bad out this way that they could not get along it, but I knew better and in fact I was able to ride most of the way, and except for a mile or so where it is being re-metalled it was very good . After breakfast I went to the PWD office and set up the seismograph, The hut was barely finished and indeed, while I was setting it up, the Chinaman who built it was putting on the door. As now it was up and I had explained the working of it to the people who will have charge of it, I started for Maoflong. Coming out of Shillong in this direction there is a long climb of 5 miles, but I was able to ride most of it. Then the road keeps along the tops of the hills and is a good deal up and down but I only had to walk about a mile altogether and got here at about 5:30, had some tea and changed, and went over to see the missionaries (Welsh) who live here. The dak bungalow is wrecked, of course, only the roof standing, but a grass hut has been built and the khamsamah, a Khasia who remembers my coming here before, gave me a very good dinner, & produced a bottle of beer so I am well off. The missionaries are living in a small house belonging to one of their converts. They were full of their experience of the shock of course. I don't think there is very much here for me to see, but I shall have a look round in the morning and then go on to Cherra. I was lucky today in getting no rain, but there is almost certain to be some tomorrow between this and Cherra. ▲Figure 21. The Post Office Shillong after the 12 June 1897 earthquake, from where LaTouche sent his letters to Nancy and from where his field assistant, Korba, collected his incoming mail. In his report (Oldham, 1899) LaTouche makes the following observation near Maophlang about co-seismic deformation of the plateau: Mr. Evans, the Missionary at Maophlang, informed me that soon after the earthquake his attention was called by one of his converts, a Khasia, to the aspect of the hill to the west of the village. These hills are separated from that in which Maophlang stands by a deep valley, through which one of the tributaries of the Bogapani runs. It appeared to them that beyond the hill, on the west side of this valley they could see more of the distant hills than before, and they came to the conclusion that, the intermediate hills had subsided. The furthest peaks they can see from Maophlang are some four or five miles distant. Of course an elevation of the more distant bills or of that on which they were standing would produce the same apparent effect as subsidence of the intermediate hills. 29th 10am Now it is pouring again. It is really aggravating as I want to go out and see what is to be seen and take some photos, but it is hopeless in this weather. I sent a telegram last night, or rather, wrote one out, to the commissioner of Sylhet asking him to send me some boats to take me down from the foot of the hills to the steamer, but it is still lying at the Telegraph Office as the line has broken down somewhere so that will mean some delay. Korba has just come in from Shillong. I had to leave him there as he could not get a cooly to carry his box. ▲Figure 22. 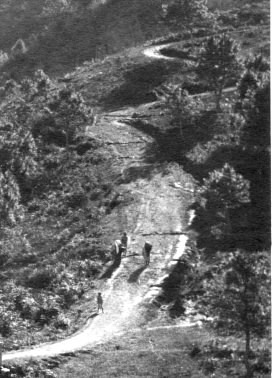 (Left) The road from Shillong to Gauhati in 1897. Bridge at 25.5874°, 91.8731°E identified by Keith Nongsteng, Shillong (2015). (Right) One of the Welsh missionary churches in 2003. 30th July 1897 Cherrapunji. It cleared up nicely after breakfast yesterday and I was able to go out and do some work. I found several interesting things in the way of gate pillars overturned etc. Of course, every building of stone is flat on the ground and the place looks quite different from what it used to do, now that the ruins of the houses that were built here long ago, when it was a sanatarium have dissappeared. While I was at tea tea Mr. Arbuthnot, the Depy. Commr walked in. He had come by another road from Shillong so I missed him when he came out on Wednesday. He is going about to the different villages to find out how many people have been killed. The first accounts were very much exagerrated, and it is doubtful whether more than 500 or 600 were killed in the whole of the hills. Most of them were killed out of doors by landslips. In Cherra the people who stayed in their houses were all right as the walls are very low, and the roof held together, but those who ran out were killed by the high walls they had built along the village streets falling on them. After tea I went up to see the missionaries, one of whom, Dr. Griffiths I used to know very well in the old days. He was very glad to see me & I sat and talked, about the earthquake of course, for over an hour. He says that what the Khaisias feel most is that the stone boxes in which the ashes of the dead are kept have been shaken to pieces. They consider it a great disgrace that the ashes should be exposed to view. The cemetery (English) here is in a woeful state. Most of the tombs have fallen over and sunk down into the ground, which has all become a loose sand. LaTouche's description of the damaged monument to David Scott at Cherrapunji in Oldham  reads: "The monument erected by the Supreme Government to the memory of David Scott is a very massive structure, built of large squared blocks of sandstone bound to each other with iron clamps. The upper portion of the obelisk has fallen, mainly towards the S.S.W., but some portion has also fallen towards N.N.E. One of the loosened stones is still lying on the top, overhanging the southern side by about 1/2 of its length (Figure 23). The whole monument above the two steps at the base has moved bodily towards SW. The stones of the lowest course of the pedestal have been shaken apart from each other, the one on the west side having been jerked out to the edge of the step below." [Oldham, 1899 p. 272]. ▲Figure 23. Monument to David Scott in Cherrapunji. 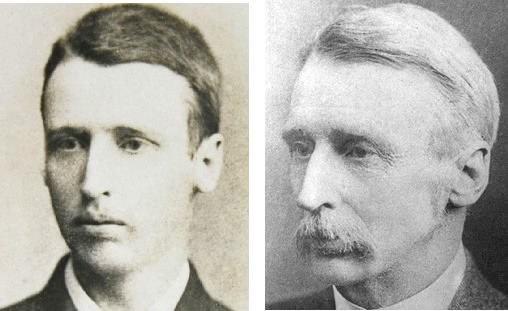 Note basal stones separated near Mr. R. S. Strachey's head, top stone shifted, and uppermost courses thrown to base. Chattuck 31 July 1897. I have had a day of it and no mistake, coming down from Cherrapunji. In the first place when I woke up at 6:30 it was pouring with rain as it had done all yesterday and all night. However, the coolies turned up all right so we started of in the rain at nine o'clock or thereabouts. All the way down the hill it rained in torrents. At one place the road had been entirely carried away and I had to scrable over boulders and wet clay, after sinking in over my ankles and fording one or two good sized streams. I was very glad when I got to the bototm of the hill, for it did not seem at all safe with so much rain and the hill side in such a loostened state by reason of the earthquake. In fact, a Mr. Peters, a half caste who is charge of the little railway at the foot of the hill, and who lives in a bungalow about half way up, told me that he had two or three narrow escapes from boulders crashing down. Luickily for me I met him at the foot of the hill and he lent me his trolly to go out to Bhologanj where I was to get my boats. The river was in high flood at the foot of the hill and was washing over the railway embankment in several places. In one place the rails were hanging in the air, but the trolly went over without accident, and in another the water was so deep over the rails that it came up more than a foot over the footboard of the trolly. The coolies had great difficulty in getting over these bad places but they all arrived soon after me. Of course there was not a sign of my two boats to be seen, and I felt very mad. Entirely wet through and not a dry spot of ground anywhere except the little station house, which was just on a level with the water. I had had a telegram just as I left Cherra from the Commisioner in Sylhet saying that he had arranged for boats to meet me but when I got there I found that his telegram to the police had only reached them this morning by post, though it was sent off the day before yesterday, and of course it was too late for them to make any bandobast [bundobast means discipline, or order]. However, after a little delay I got two boats from the village and soon got into them, and at once had a change. My things had kept wonderfully dry considering the downpour & I don't think I shall be any the worse. I am waiting now (8pm) for the steamer from Sylhet, as I am going down to Sonamganj, a place about 30 miles down the river river tomorrow. The babus there have been worrying Mr. Cotton with telegrams saying that they think the place is sinking and he asked me to go down and see what they mean. It is rather a nuisance as I must come back this way to go to Sylhet, but there is no other way of managing it, unless I waste a whole day at Sonamganj. As it is I shall get back here by the way-up steamer and to Sylhet on Monday morning. I don't think I shall have to stay there for more than a day and then away to Calcutta and you! You may be sure I shall not be a day longer away from you than can be helped, but of course, until I see Mr. Oldham I cannot fix a day for starting. I have got a good deal of my earthquake report done and I hope to get the rest finished on my way down the river, I should like to be able to hand it to Mr. O. all finished when I get to Calcutta. Sonamganj, 1 Aug. 1897. You know that I had intended to come down here this morning by steamer, see the place and hear what the people had to say and go back to Chattuck by the afternoon steamer and onto Sylhet tomorrow. Well I came down all right, the steamer came in very later last night , about 11. But I went on board and had a good sleep. I had a great [deal of] talking all day with the people here, planters and such like, whom were in a great panic because they think the whole place is sinking. I think I was able to reassure them to some extent. The place is certainly unsafe close to the river bank, which is much fissured, but further in it is all right, but there is very little room for building houses as the only high ground is just along the banks of the river and not more that 200 yds wide or so. Well I walked and talked with them till 4 o'clock when the steamer was due and then sat down to wait for it, but it has never turned up , and now it is nearly 8 o'clock. Here I am then stranded with nothing to eat but a part of a loaf, which luckily I got from the steamer for my breakfast, and some eggs which the chowkidar of the rest house is cooking for me. I am lucky to have a sound roof over my head but it is rather aggravating instead of getting a comfortable dinner on the steamer, I have to put up with a hard boiled egg. Steamship Migi, 2 August 1897. At last I have got away from Sonamganj where I was stranded like Robinson Crusoe on a desert island till this afternoon. The steamer never turned up at all yesterday evening, she had run aground somewhere down the river so I had to make my dinner of 4 hard boiled eggs my quota at two this morning, and breakfast again of three, so you can imagine I haven't much of an appetite for eggs just now. The worst of it was that just before breakfast time I heard the whistle of the steamer coming up the river. Oho thinks I, I shall have a real good breakfast on board , and start off through the rain to the ghat. When I got there, there was the steamer sure enough, but what was my disgust to find that she was going no further up the river, but would turn round and go down to pick up the mails from Dacca. Otherwise the Co. would get fined under their contract, and there I was and had to go back to my eggs. I was so flabbergasted that I did not even think of getting some biscuits or something from the steamer until it was too late. However about 5 o'clock the next steamer came up and I got taken off my desert island. Sylhet 3 Aug. --- Soon afterwards we arrived at Chattuck when I had to change into a smaller steamer which runs backwards and forewards to Sylhet, so here I am in Sylhet at last. I am feeling none the worse for my experiences. 4 August 1897 between Sylhet and Chatuck . I managed to finish all I could find to do at Sylhet this morning so I am getting away from it a day earlier than I really expected to. But I was somewhat in suspense up till the last moment for I had to telegraph yesterday to Calcutta for some money to me there and, of course, as usual about here, the telegraph line was out of order because of the floods.---In the morning after making several measurements and plans in the station I rode out along a fairly good road to a couple of tea gardens about 3 miles out, and had a look at the damage done there, though a great deal has already been repaired. One of the planters is a man whom I had met before at Shillong, a Mr. Turnbull. This steamer shakes so I cannot write well. In fact when we started from Chattuck I was asleep and when the steamer began to move I had a very vivid dream that I was in the field opposite the vicarage at home and that an earthquake came on and fissure began to open in the ground. Now I thought I shall be able to see exactly what goes on when these fissures open, & I got out my note book, when I awoke and it was all a dream. I feel quite jolly that I am really getting nearer to you every minute my darling. LaTouche's letter on 5August describes the steamer being grounded in shallows and being slowed by the numerous acute bends that slowed progress on his river route to Dacca. Steamship Manipur 6 Aug 9 pm At this rate we ought to get to Goalhindo early tomorrow afternoon, but there will be a long wait till 9:30 in the evening when the train for Calcutta starts. I have done a good bit of my earthquake report and hope to get it nearly finished by tomorrow, at least all the drawings done. I thought I had lost my note book, the one in which I have made all the earthquake notes. What should I have done if it had gone? I left it on board the steamer on which I went up to Chattuck the other day, and did not discover that it was not in my dispatch box till I got to Sylhet. I wired at once to the agent at Neerangunj, and when I got there today I found to my great relief that it had been found on board. I shall go & see Mr. O the first thing you may be sure and find out what he has to say. Probably you will know the result of the interview before you get this. I finished the plans and sketches today, at least all except one or two at Cherrapunji which won't take long. They cover about 30 sheets of foolscap. I hope Mr. O will be pleased with them. Calcutta 8 August 1897. My own sweetest Nancy, I can only send you a short note this evening I am sorry to say as there is not much time to spare. I have been busy all day as you can imagine. As soon as I arrived here about 6 o'clock I had a cup of tea and got out my plans etc. and finished them up for Mr. O's inspection. After breakfast I took them over to him and he was greatly pleased with them - so after we had had a talk about my tour I asked him if I might go to Mussourie & he said yes as soon as I had handed in my earthquake report, so that was a great weight off my mind. I have been smiling broadly ever since. My own darling, isn't it delightful to think that we shall be together soon. The great thing is that Mr. O. doesn't want me to stop down here. Calcutta 9 August 1897. My own Darling Nancy, I have been hard at work writing all day long and have really got a whole lot of my earthquake report finished . I wish the plaguey thing was quite done. 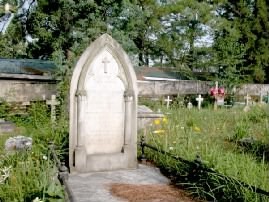 I have got as far as the Shillong cemetery, and when that is done there will not be very much more left. 10 Aug: The report you will be glad to hear is very nearly finished and I will have it quite done done this evening, if all goes well. Then tomorrow I must tackle those rocks and register them, and at present I have no idea how long it will take to get them done. LaTouche thanks his wife for anticipating the purchase of some beer "India Pale Ale sounds best. I suppose they have it in 2 gallon casks"
Calcutta 11 August 1897. My own Darling Nancy, The report is finished at last, Hooray! and in Mr. O's hands. He seemed to appreciate it very much. I then tackled my rocks and got in very well with them . However they will be off my hands tomorrow I hope and I am sure I will be able to start on Friday evening. LaTouche's report appeared as 20 pages in Oldham's 1899 Memoir on the earthquake (Appendix A, pp. 257-277). It is not known what happened to the seismoscope records from LaTouche's pucka improved instrument, or why Oldham fails to mention them in his seismometer Appendix E (pp. 358-359) of his 1899 memoir, or in Oldham's three subsequent articles on aftershocks 1900-1904 [Oldham, 1900; 1903; 1904]. In his 1899 appendix he describes the selective overthrow of the set of Mallet-designed vertical cylinders at Shillong both in the mainshock and aftershocks. It is possible that Oldham was sceptical of the accuracy of LaTouche's seismoscope, suspicious of its amplification factor, or uncertain about the effects of resonance and friction. It is also possible that LaTouche's trained operator was unable to maintain the instrument, or print the smoked glass records. No further mention of his instrument appears in LaTouche's correspondence in the next few years, nor in LaTouche's "Bibliography" published in 1917, which omits his August 1897 letter to his father published in Nature (J. D. LaTouche, 1897). However, LaTouche does indeed mention his seismoscope once more - in the flurry of excitement following the 1905 Kangra earthquake he states that he has sent a copy of his instrument, constructed by Oldham, to Simla. LaTouche's original photographs of the 1897 earthquake have not been found among the photographic archives of the Geological Survey of India. It is possible that they were among those damaged by water from a leaking roof some ten years ago. LaTouche joined Nancy in Simla for the remainder of August and September 1897 where he finished his Rajputana report [LaTouche, 1902]. He departed 14 October for his next tour of field work through Delhi to Ajmere, Jodhpur and Bikaner. LaTouche, like Oldham, never became Director of the GSI, but was appointed Acting Director for two years prior to retiring in 1910. LaTouche published more than 50 articles on the geology of India. His magnum opus was a four volume index to the geological literature of India, culminating in a 576 page geographical index of every place mentioned in the publications of the Geological Survey of India since the time of its foundation in 1850 to the time he started writing the work in 1923. The more than fourteen thousand entries are in alphabetical order, and give coordinates and the rock, mineral, fossil or earthquake information associated with each place name, plus an author and bibliographic reference [LaTouche, 1938]. He finished this work at age 81 and it was printed the following year a few months before his death (Middlemiss,1939). Nancy survived him. I thank the British Library and the Center of South Asian Studies in Cambridge for access to the handwritten letters referred to here. I am indebted to the Director of the Survey of India for permission to use the photographs of LaTouche, and to Sujit Dasgupta of the Survey of India and Wendy Cawthorn of the Geol. Soc. of London for assistance in identifying research materials. I thank Geoffrey King, L'Institute de Physics du Globe, Paris, and the National Science Foundation for their support during this study. Gait, E., Report on the earthquake of the 12th of June 1897, Home Department, No.5409G, A.S.P.O. (Genl. ), No.282-850-18-8-97, pp.1-72, Shillong, 14 August 1897. LaTouche, Rev. J. D., (1897), The late Earthquake in India, Nature, 56, 444-5.LaTouche, T. H. D., (1897), The Calcutta earthquake, Nature, 56, 273-274. LaTouche, T. H. D., (1902) Geology of Rajputana. Mem. Geol. Surv. India, 35, 1-116. LaTouche, T. H. D., (1917) A Bibliography of Indian Geology and Physical Geography, Geological Survey of India, Calcutta pp.571. LaTouche Papers, 1980-1913. The British Library India Office European Manuscripts, Mss Eur C258. LaTouche, T. H. D., (1938). Geographical Index to the Memoirs volumes I-LIV, Records, I-LXV, of the Geological Survey of India and General Reports of the Director for the years 1897 to 1903, Calcutta. pp.576. Medlicott, H. B., (1880), Annual Report, Rec. Geol Soc. India. 13(4), 281-282. Middlemiss, C.S., (1939), Obituary of Thomas Henry Digges La Touche, Quart. J. Geol. Soc. London 1939. Oldham, R. D., (1899) Report on the Great Earthquake of 12 June 1897, Mem. Geol. Surv. India, 29, pp. 379. Oldham, R. D., (1900), List of aftershocks of the great earthquake of 12th June 1897, Mem. Geol. Surv. India, 30 (1), 1-102, Calcutta. Oldham, R. D., (1903),The diurnal variation in frequency of the aftershocks of the great earthquake of 12th June 1897, Mem. Geol. Surv. India, 35(2), 117-155, Calcutta. Oldham, R. D., (1904), Aftershocks of the great earthquake of 12th June 1897, Mem. Geol. Surv. India, 35(3), 1-23, Calcutta. Sweet, M. Papers. (Mrs. May Sweet) Given by The Revd. J.P.M. Sweet, grandson of May Sweet. 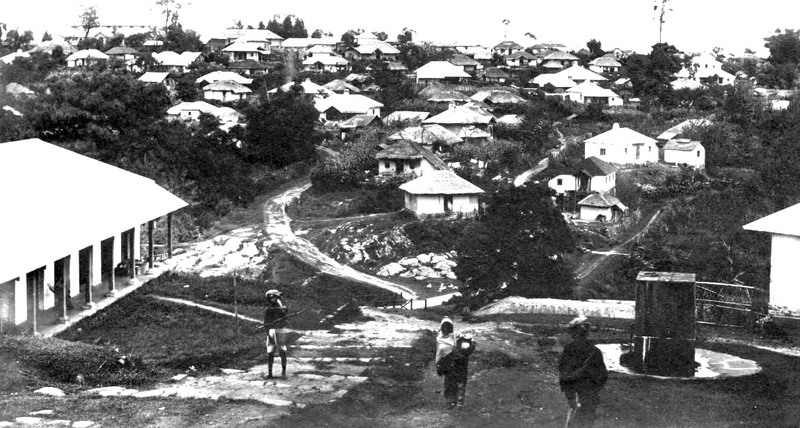 Shillong, Assam: 1897. Xeroxed copy of a letter from May Sweet to her sister Mrs. Godfrey dated 28th June 1897 from Shillong. 7pp. (Small collections, Box 22) Center of South Asian Studies, Cambridge University.